I saw this box for sale cheap a few months ago and snapped it up. I had been looking for some kind of master clock sequencer, actually to replace my Mobius CV sequencer. Nothing wrong with that, except its only 1 voice, and take up 3 U. Would have like a Sequentix Circlon.. but.. way out of my price range Im afraid! 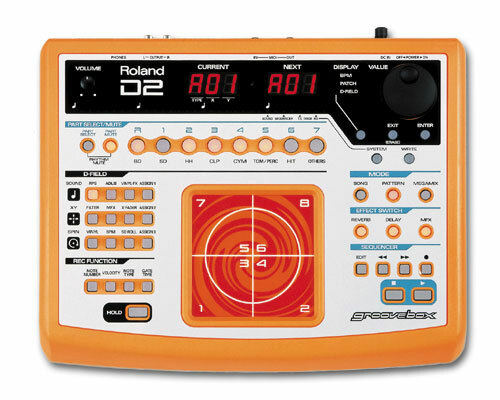 The Roland D2 came out over 10 years ago, and almost immediately died. I suspect because of it biggest flaw. Its orange… ORANGE I TELL YA! What were they thinking? It being a low end Roland, they have gone with an annoying segment display, and therefore you have to get used to the fact that h is 4 and s is 5 etc.. and everything is shortened to 3 letters so ntr means metronome, and Ocr is Octave Range. But.. the good side… its sounds great! masses of patches (256 user) and many many sounds, haven’t counted but maybe 1024? Most (ok all) of the pre made patterns are horrible, as this is definitely meant as a dance oriented machine, and (again, being Roland) you must scroll thru them to get to the user editable patches… so you end up hearing the 1st, horrible patch many time.. YIKES! Plus it has a Pre conceieved but useful External Midi config. In that the 7 tracks all send out midi on midi channels 1-7, and the rhythm track send out on channel 10 (as per the GM standard) Per track you can use sound from the internal G2 voice, the External sound module or both! The only stupid thing is that in order to program a part on an external sound module, you wil hear the internal sound, too WHILE you play. On playback, if you have the internal sound muted only the external will sound. This if obviously a bug. Programming is a tad funky, they expect you to input notes by using the “D-field”, which is their attempt at a kaos pad type controller. Its not however, no feel at all and very unresponsive, often doesn’t trigger at all. However you can plug in a midi keyboard and suddenly it all becomes easy. You have 2 ways, Real time and Step Time. Realtime works for me, as you can play in from your external keyboard and delete by pressing the erase combo when you want to remove mistakes. Its fine.. There is quantise that you can apply on the way in, forcing your playing to 8th 16 32s etc.. or apply afterwards… Careful though.. NO UNDO!!! The problem with this method is that its impossible to edit one note, say you hit a G instead of an F. Only way I have found is to delete that one note and try to drop it in again. Step recording however, is a right old palaver, but probably no worse than most drum-machines. You know, you scan to the beat you want to add, press a button to audition the note you will add, change it till its correct and hit enter… more to new location for next note. Slow, but precise. The good thing is that all notes are shown on the LED display, so you can go back and edit them after they have been edited. No such luck with the notes you added via Real Time mode… no way to see them buggers. However, its in performance that this thing has so many amazing options. Things Ive never even thought of, and have NEVER seen on other sequencers, hardware OR software. There are some other things that I haven’t really gotten to the bottom of yet, more DJ style things, particularly the so called and DJ named “MEGAMIX” function.. Cant see myself using this, but still. Its where you can grab a track from other patterns and try them on the current pattern. I guess if you have lots of variations, you can switch between them. But I haven’t tried this yet. I am using it to send clock to my analog sequencers (the Doepfer and the Mobius) Im using to sequence my ancient Proteus Orchestral and and my Korg MS2000. My parts on the upcoming Electricity Album are all being done from this. Incidentally… We have a special PRE-ORDER offer on the new Album. Heres showing a typical way to bend your story in “The road up to Hell”. 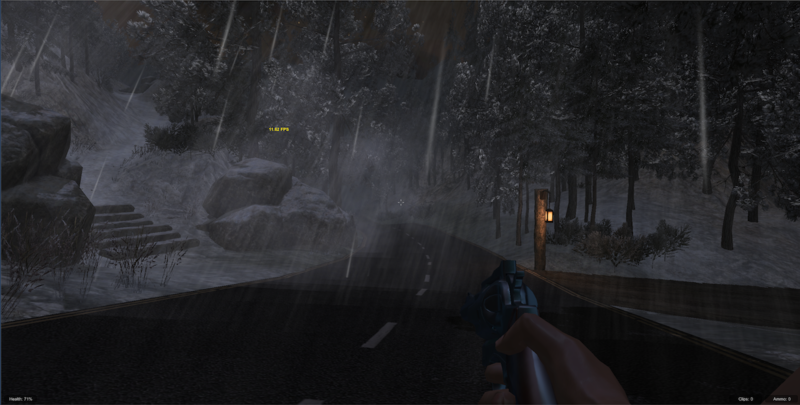 Will you go straight on down the road, left up the snowy steps into the mountains, or right into the dark forest?